For Graham Coughlan, leading a team out at Wembley would be nothing new. 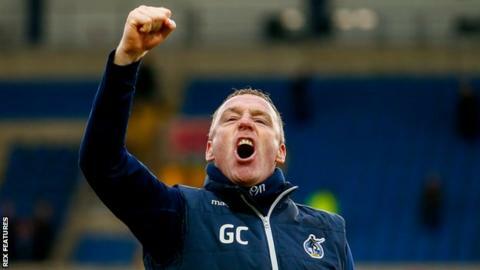 The Bristol Rovers manager is an old hand when it comes to showpiece finals, but a Checktrade Trophy semi-final victory over Sunderland on Tuesday would mean a moment to cherish less than four months into a managerial career he had feared had passed him by. "I had lots of applications and several interviews but they were all unsuccessful," Coughlan told BBC Sport. "I'd always wanted to be a manager. I felt every club I'd been at, as a player or a coach, I'd left in a better state than when I arrived. "But I thought I'd missed the boat. It's frustrating when you miss out on interviews or clubs won't even accept your CV. "I'd been a coach and an assistant manager but I was thinking I would always be the bridesmaid. "It took 10 years for me to get a manager's job and it came in unfortunate circumstances with Darrell Clarke leaving, but it was an opportunity I couldn't turn down and I just need to grab it with both hands." Coughlan took charge of the Gas in December when Clarke's reign ended by mutual consent after four and a half years at the helm. Three victories in five games as caretaker manager, allied to a ringing endorsement behind the scenes from Clarke, earned him the full-time position. Victory over Jack Ross's Sunderland would see him finally lead his own team out at Wembley, having done so with Southend side six years ago. Coughlan was given the honour by the Essex club in 2013 when they appeared in the final two weeks after sacking Paul Sturrock, Coughlan's coaching mentor. Phil Brown, Sturrock's replacement, was already in charge but decided Coughlan should take centre-stage. They lost the final 2-0 to Crewe but the game was just one of several Wembley appearances for Coughlan, whose career as a journeyman defender began among the superstars of Blackburn's Premier League title-winning squad in the 1990s, including Alan Shearer and Chris Sutton. "I was playing in the League of Ireland and Kenny Dalglish saw me and invited me over to play in a game. I must have done ok because he signed me," said the 44-year-old. "I never quite managed to play a game in the Premier League, which still frustrates me, but I just don't think I was quite good enough. "But I learned a lot from being in a dressing room that was full of the cream of English football, and full of winners. "It was a dressing room of top professionals, run brilliantly by Tim Sherwood, who was a superb captain, and I learned about how top players came down hard on each other if they weren't performing or pulling their fingers out. "They say if you've got great seniors you'll have great youngsters and a lot of youngsters from that time, like Damien Duff, Shay Given, Damien Johnson and David Dunn, went on to have good careers." Coughlan's career took him via Livingston, Plymouth, Sheffield Wednesday, Rotherham and Shrewsbury, who he captained in a Wembley play-off final, to Southend and eventually to Rovers. His wait for the top job was a long one, yet his appointment has brought its own challenges, including time away from children Shannon, aged 17, Kian, 13, and six-year-old Rachael, who remain at the family home in Sheffield. "I used to be able to get back at weekends and some evenings to see them, but that doesn't happen as often any more," he said. "I try to get back at the weekend but I didn't last weekend, so when I see them it will be two weeks since I last got back. "But I knew that was the nature of the job. It consumes you and takes up all of your time. I've got an amazing family who support me all the way and they know how long I've waited for this chance, so I have to make sure I grab it." The winners of Tuesday's semi-final will face fellow League One club Portsmouth in the final at Wembley on 31 March.